Hello friends! I hope you had a great weekend! I have a busy week ahead of me but I wanted to pop in to share a fun little card I made for the Feature Focus Post over on the ODBD Blog. Today we are focusing on the ODBD Custom Apron and Tools Dies, and the Custom Recipe Card and Tags Dies. These are super fun to work with and the Apron Die that I have used here makes such fun and easy cards in a hurry! I used this happy MME dp called Fine and Dandy on a base of vanilla for my apron and I love the sort of retro look it gives. I have so much fun trimming these little aprons out!!! I used SB Romantic Rectangles for my "lace" trim, and an MS Punch for the lower edge. Since this month's ODBD stamp release is focused on a garden theme, I decided to use a sentiment from the Garden Sentiments set, and I cut it with one of the ODBD Elegant Ovals dies. The tools are cut from card stock and colored with Copics. I tied the scissors on to the apron as that has a special place in my memories of loved ones. You have to admit... scissors are always handy to keep near at hand whether gardening, sewing, crafting or cooking! I remember my grandmother wearing an apron what seemed like all the time.... but now I'm thinking that wasn't such a bad idea! 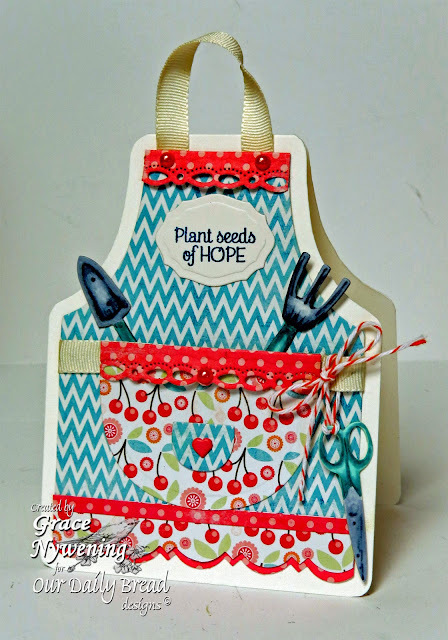 Please see the ODBD Feature Focus post for more inspiration using the Apron and Tools Die and the Recipe Card and Tags die. My DT sisters would love to have you come see what they created for this post! Please visit them as well! What a wonderful project, Grace! I love the design with the fresh, cheerful papers and great stamps and details! Very creative! Hope all's well! Hugs! Very cute Grace, thanks for showing! What a fun way to use an apron card -- as a garden apron! Lovely little card! Wow Grace! This is adorable.What a super idea for a gardening person. I love the DP's and the cute tools. AWESOME!!! !Love your card,SUPER CUTE!! !Have a Blessed day!!! Love your idea to make a gardening apron, too cute! Hi, Grace! This is so cute, fresh and fun! Great bright colors! Fabulous job, Grace. This is just adorable, and SO sweet with that little pocket and all the lovely touches. Thanks SO MUCH for sharing this in our challenge. I'm always so blessed by your art, and grateful to have you share with us. God bless your week with His goodness and love! So sweet. It reminds me of granny getting ready to go out and garden. Thank you so much for sharing your wonderful paper craft project with us today at WAW. We love seeing your art. This is too sweet and beautiful Grace!! I just love the little pocket with the tools and the gorgeous details you added with the beautiful choice of papers!! Darling! !